Hi, I am an qualified Artist. I did my BFA, living in Bangalore, Karnataka. My favorite media is water color. many of my paintings decorate walls in India as well as in abroad. Hi, I am Subhashchandra Gowda, a Qualified Artist from Shimoga, Karnataka. My favorite media is water color. 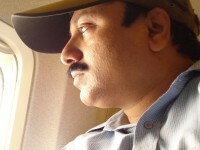 I have 18 years of experience in Visual art, living in Bengaluru since 1997. Art works shall be shipped properly packed, rolled, or framed as suitable, using reputed courier services only. Please do not accept if the shipment appears damaged/tampered with on arrival. Given the nature of my artworks, providing refunds/replacements shall not be possible. However, in case you have any concerns for me to look into, please reach out to me within 36 hours of receiving the artwork and I shall be happy to help.